Today we would like to talk about the extend edition of Packs! that will pop up on Kickstarter next week. Note that our work on the English version is almost finished, so you won’t have to wait forever for your backer rewards (we did some crowdfunding in Germany before, and let’s just say we learned an awful lot about being late). The original edition was, of course, already a complete game, although a really, really small one. The description of the setting contained an overview of the old department store and its different levels, a collection of myths that are told about life, the Ratlair and everything as well as some pages about your existence as a rat – what they are (quite ordinary, in fact) and what they are definitely NOT (quirky antropomorphic animals with old-fashioned trousers). The seven dominant hordes were introduced in detail – their customs and cultures, their strengths and weaknesses, their habitats, their delusions and their most famous heroes. 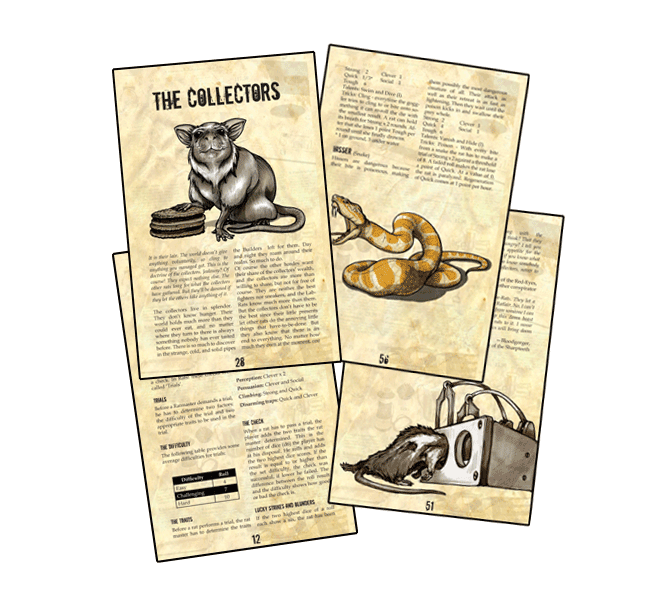 Just in case life wasn’t hard enough already, you could also find a bunch of old traps and hungry animals – more like mythical monsters and mysterious temptations to the rats! And, of course, there were some short story hooks, a complete adventure and the original rules we introduced in the last blog post. Now for the “extended”! The 100-page-something core book we would like to fund using Kickstarter is still small (that’s intended! ), but will not only come with an additional rule set for Savage Worlds, but also contain two newly emerged hordes, a useful rule overview, a luxurious character sheet and extensive additional adventure content to populate the Ratlair with stories and ideas (and, again, more stuff that wants to kill your characters). Solve the secrets of the enigmatic Tickers the Builders left behind. Face eccentric Nodders in search of the treasures a crazy Collector hid in the outskirts of the ratlair. Perhaps you might even be able to meet a real Builder. No, really…! We are totally stoked to let the Packs! out into the English-speaking world with this extended edition, and we hope you will join us for the ride.